Wondering about the recent changes to groups? LinkedIn groups have been redesigned to make interactions more seamless and valuable for members. 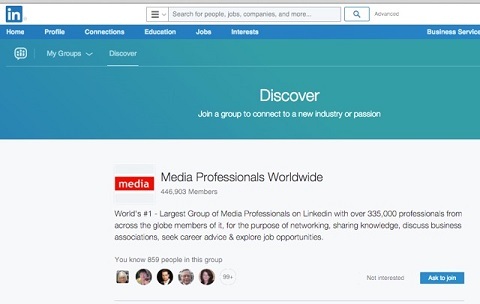 In this article you’ll discover how marketers can find, join and use the new LinkedIn groups. LinkedIn completely overhauled its groups interface, so the desktop and app versions are the same. The Groups app is available on iOS, and the Android version is coming soon. 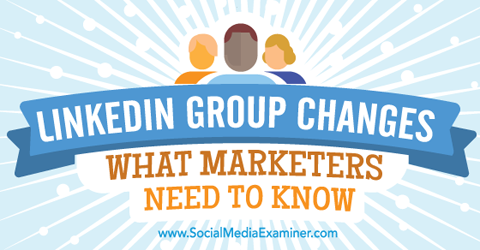 Discover what marketers need to know about the changes to LinkedIn Groups. While both the website and app are user-friendly, the functionality on desktop has decreased. One of the most noticeable changes is that there are no more open groups. The two new group choices are limited to standard and unlisted. Standard groups are “request to join” or a member or admin can invite you to join, and are findable by group search. Unlisted groups are “invite to join” by the group admin only, and are not findable in search. Although it will be more difficult to use groups for prospecting and lead generation, people can still use groups for content marketing. Due to the changes, there is no longer a way to easily search group members by name or keyword. LinkedIn has also removed the Promotions tab on groups, which means any promotional messages will likely just go into spam. The upside is there will be a lot fewer pitches and less spam in groups. The downside is it may be difficult to discern what is and is not promotional content, so valuable information could get lost in people’s inbox. It also could mean a lot more work for group moderators. 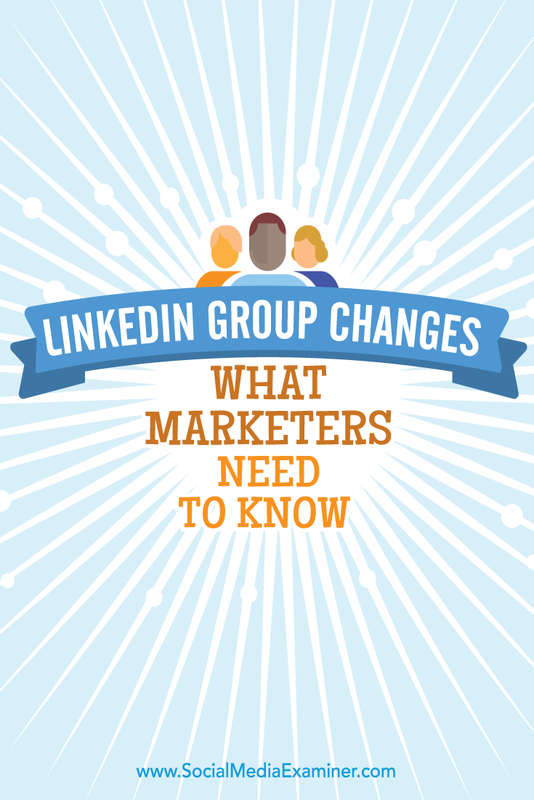 The LinkedIn group changes will force marketers to step up their game. They will have to be more conscientious about the content they create and share, so it’s of higher value to group members. In spite of the changes, if you regularly post valuable content, you can get the most out of LinkedIn groups. 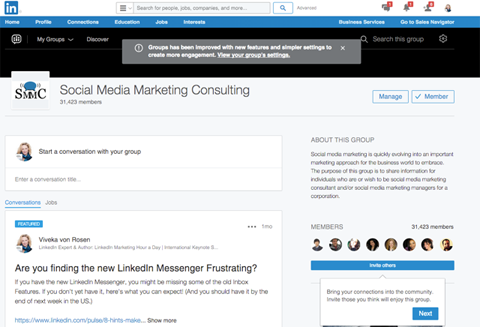 Let’s take a closer look at the changes to LinkedIn groups. 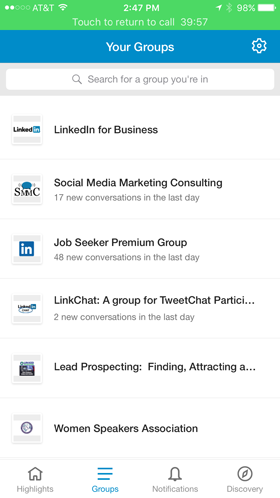 All LinkedIn groups are now standard or unlisted, and are both private. This means that conversations shared in a group are no longer public. Standard groups have similar functionality and purpose to the previous version of groups, in terms of posting and sharing information with fellow members. Group content is hidden, however, unless you’re a member of the group. One change you’ll notice is a Highlights page, which lists the most engaging posts in your groups. Go to Interests and Groups to get to your group homepage. 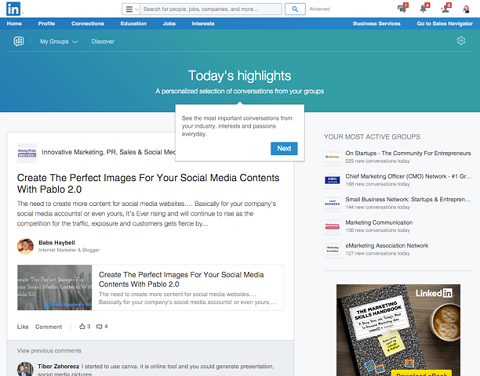 LinkedIn’s Highlights page emphasizes the most engaging content in your groups. Any member of a standard group (not just an admin) can invite people to join, and any user can request to become a member of the group. To save time, ask a friend who is already a member to add you. Anyone can add members to a standard LinkedIn group. You’re able to use standard groups for marketing, but you have to be smarter about it. Engage more and share better content to meet fellow group members. These relationships could translate into new business down the line. 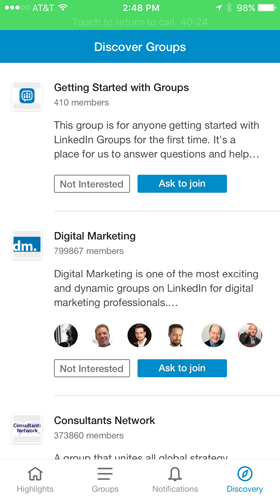 You can’t find unlisted groups through a LinkedIn search, and only a group admin can invite new members. The good news is that extraneous groups that limit access will no longer bog down search results. The unlisted category is ideal for internal groups within your company. Your content will be completely private, since there’s no chance for outsiders to gain access. There are plenty of reasons to start an unlisted group. For example, you can create user groups to beta test new products and concepts, use groups as customer service support for clients or start internal groups for employees. Remember that unlisted groups are strictly for content, not marketing, so they’re valuable for communicating with designated people. Standard groups show up in LinkedIn searches. Technically you can find them on Google, as well as by using the Groups directory. The best way to search for a group is on LinkedIn. Search for standard groups by keyword from LinkedIn’s main or advanced search. LinkedIn will also make group suggestions, based on your interests. If you find a group you want to join, look for a group button and ask to join. LinkedIn will make suggestions of groups you might want to join according to your group activity. To expedite the process, see what groups your friends are in (which are listed on their LinkedIn profiles) and ask them to add you. 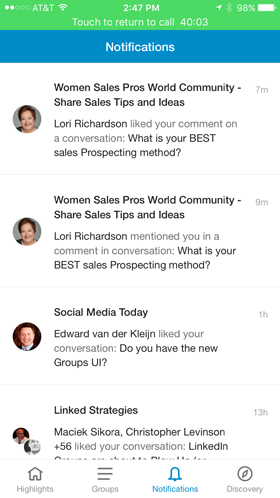 The LinkedIn Groups app makes it easy to engage with group members on the go. Like on the desktop version, your homepage has highlights that tell you what’s popular in all of your groups. 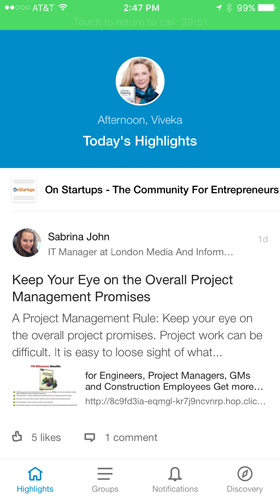 Log into the LinkedIn Groups app and see highlights from your groups. 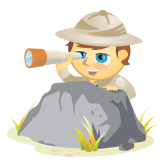 The group search in the app is user-friendly. Discover new groups to join on the app. Click on any one of your groups to access the content. Then engage with others by posting, responding and liking content. You can now mention people in updates and comments with @mentions. All of your groups are at a glance. 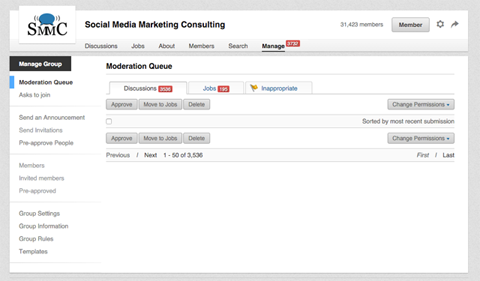 Finally, you can use the Notifications tab to see who is commenting on your content, so it’s easy to respond. Visit the Notifications tab to easily respond to content in your groups. While LinkedIn groups may no longer be good for lead generation and prospecting, the new interface makes it easy to post, respond and develop relationships. This could lead to getting new clients in the long run. You may want to create a standard group in your niche to position yourself as a thought leader. As a group owner, you can send out private announcements once a week, save templates and keep an eye on group moderation. Create your own group to position yourself as a thought leader and take control of content. Anyone, group owners and members, can post content to standard groups. There are plenty of LinkedIn groups out there. Before creating one of your own, decide if the benefits are worth the time you’ll have to invest to manage it. LinkedIn clearly wants to go back to what groups were in 2007 (high-quality content and engagement), before they were spam pools. The changes are designed to encourage marketers to get back to true engagement. It’s certainly better than machine-gun posting (sharing everything to see what sticks), and could ultimately increase your customer base and bottom line. The new LinkedIn groups should be better for building relationships, which is what social media is all about. What do you think? 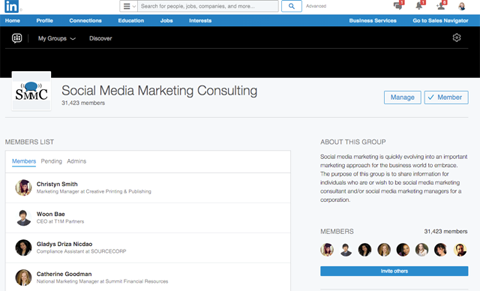 Have you explored the new LinkedIn groups? Have you tried the Groups app? How are you using LinkedIn groups now? Please share your thoughts in the comments. Tips for using the new LinkedIn Groups.